A printable concept book for children to learn the different climates around the world and become authors and illustrators of their own little books. Ideal to use as a whole class activity or as an independent homework task when learning about the different climates around the world. Children illustrate what each climate looks like and/or an animal that lives in that environment. Children then illustrate and write the climate they live in. Print, cut each page in half, then staple together on the side to create a little book. 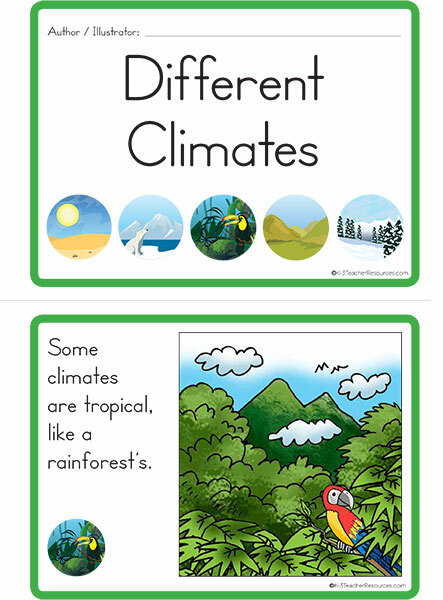 Provide the children with their own copy for them to illustrate each climate. What would come next? – Make a class book using photographs of each climate.